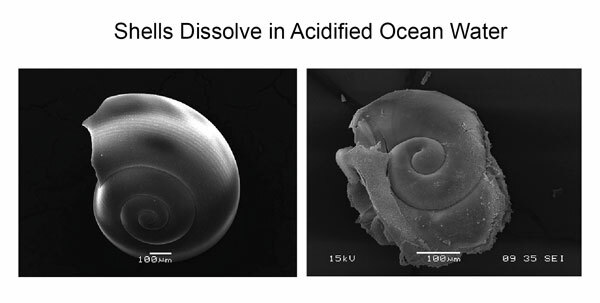 But while most scientist focus on pH as a metric for the influence of ocean acidification on calcifying organisms, there is a push for a different metric, the saturation state of carbonate (mineral used to build shells) — essentially, the amount of the mineral dissolved in the ocean water relative to the maximum amount it can hold. George Waldbusser, a marine ecologist at Oregon State University, and colleagues discovered the importance of the carbonate saturation state while attempting to determine why oysters at a hatchery along the Oregon coast were experience low survivability. They devised a study that separated the effects of pH, CO2, and carbonate saturation state on the larvae of oysters, and what they found was the survival rate of oysters plummets for oysters when the saturation state of carbonate dips too low, because their shells grow more slowly and are deformed. The findings of this study are important not because they refute the influence of pH on the survival rate of calcifying organisms; it is proven pH significantly alters the internal chemistry of calcifiers. But as Waldbusser et al. point out with their study, the more serious concern is the saturation state of carbonate, which has a more sensitive response to elevated CO2 levels than pH. Meaning the impact of carbonate saturation state will be a more serious concern before pH, and thus requires attention. Read more about this interesting study published in Nature.